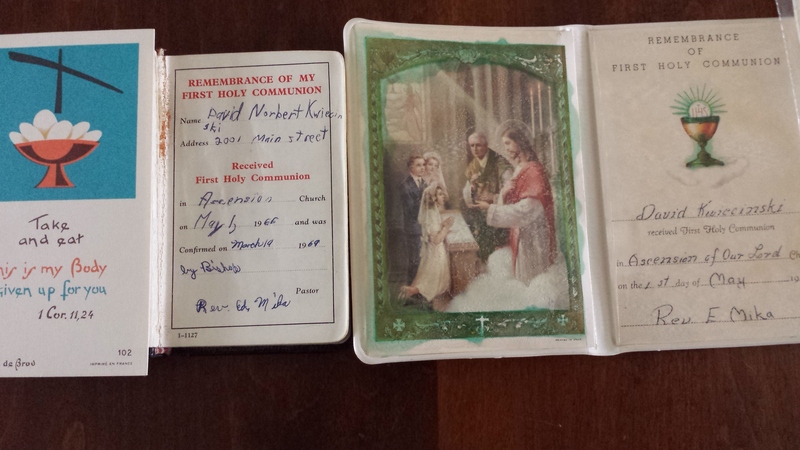 I made my First Holy Communion. Ascension of Our Lord Church. Could be among the oldest stuff that I own that’s actually my stuff. Because it’s important to have my home address in the Mass book… and apparently, my name is simply too long. 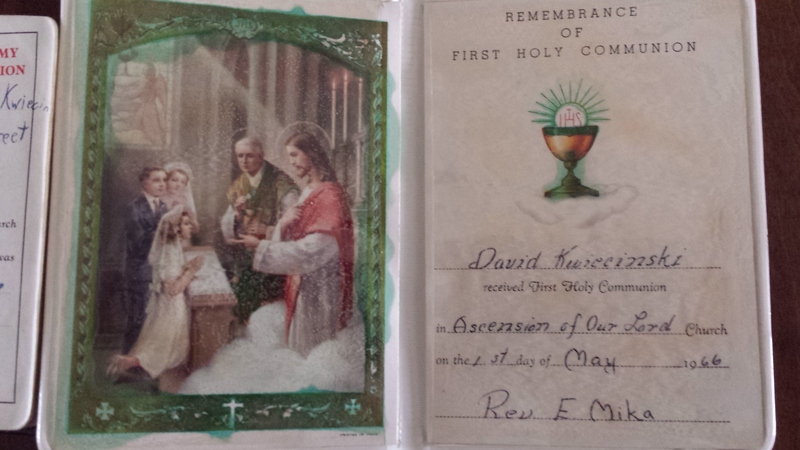 Back side of the “Take and eat” holy card. 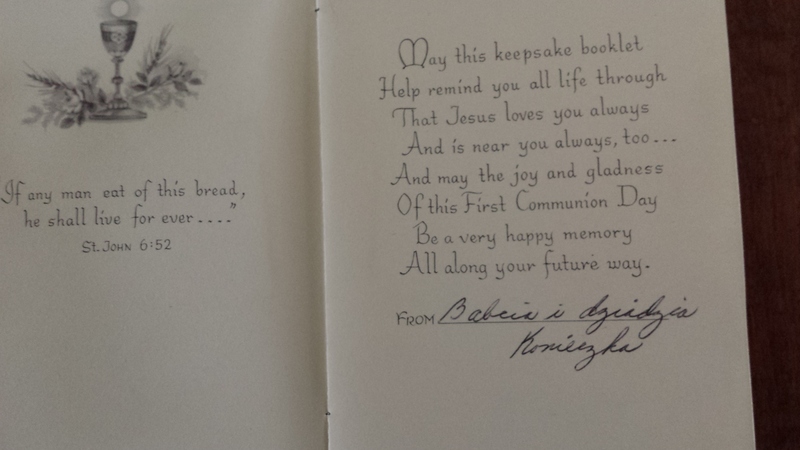 From Aunt Bernie. With the names of my six cousins inscribed. Yes, only six ‘country cousins.’ In 1966, Mary was still only a twinkle in Uncle Stan’s eye. I’m not sure who gave me this gift. Was it from the school/church? I don’t remember and didn’t see any marking on it. I love these books. 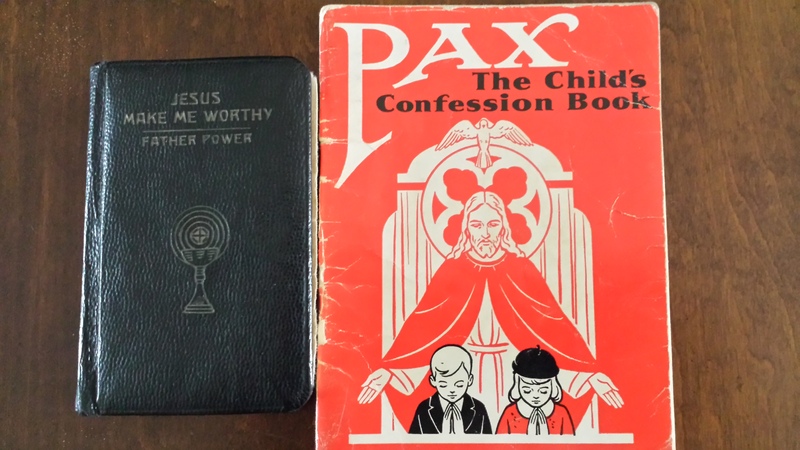 The Mass book (Jesus Make Me Worthy) is dense! Much helpful information packed into almost 300 pages. Short, simple chapters. A wonderful explanation of the Mass, from the perspective of the pre-Vatican II liturgy, when the priest faced the altar and tabernacle at the back of the sanctuary, away from the congregation, in reverence to the Blessed Sacrament. The confession book asks very simple questions of a child about behavior. Each Commandment has an illustration that makes right action and behavior even more understandable for a child. Yeah, the tie actually fit. 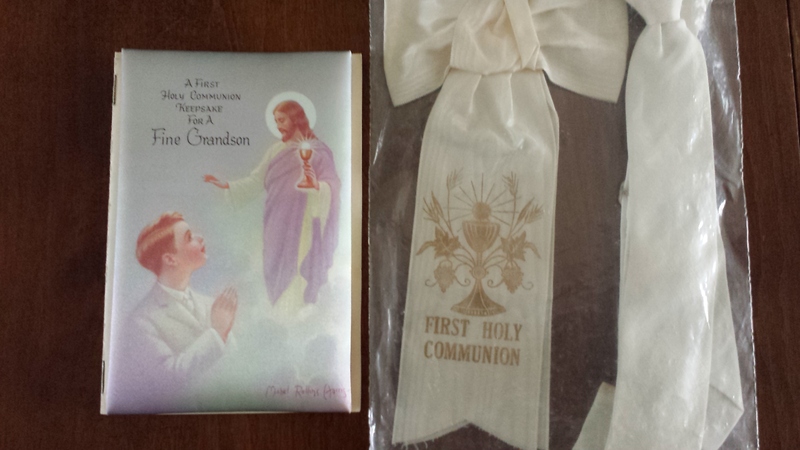 A sample page from the book, preparation for First Communion. Among the densest of the pages. 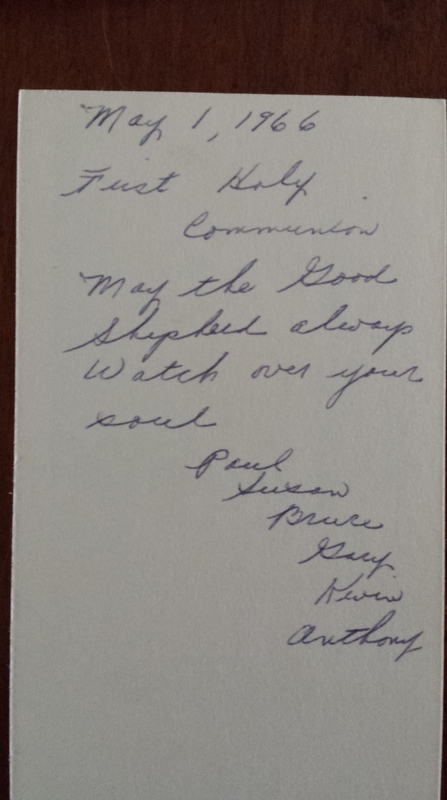 And Mom’s handwriting in the book given to me by Babcia i (“and”) Dziadzia Konieczka. The end of the book. How’s this for a simple explanation for how a child should live? Thanks, God, for the memories. The Cure for Insomnia. Guaranteed. These people can’t fall asleep. They have “tried everything.” Nothing seems to work. It works every single time it’s tried. You don’t need sleep aids or pills. You don’t need chamomile tea or warm milk with butter and honey before beddy-bye, although these are fun and dee-lish! NOTE: My solution is not intended to replace medical advice. If your doctor has prescribed medication for you, or if you are being otherwise treated for a specific medical condition, do not disregard his/her advice! If you have any doubts or questions, consult your physician. But… I’d still suggest you ask them if you should try my advice. Are you ready for my guaranteed, no-fail cure for insomnia? Have you read my disclaimer? Do you understand it? 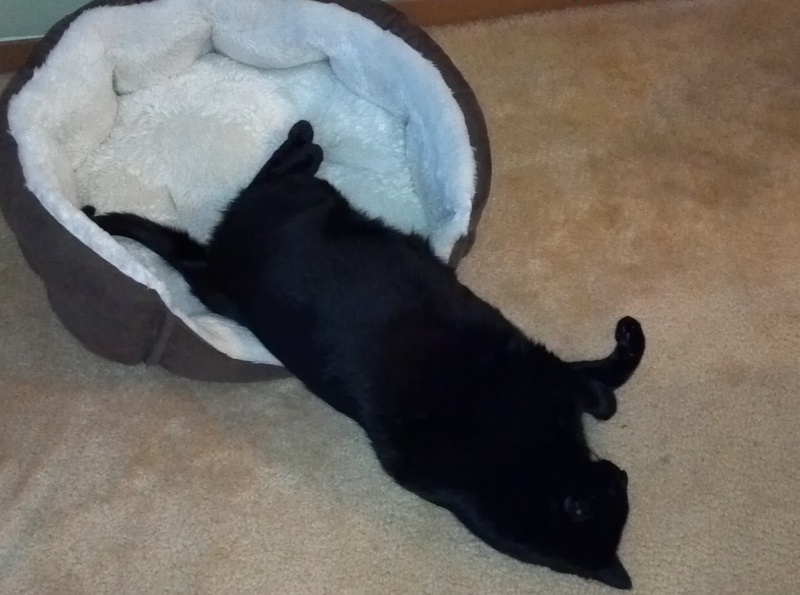 Want to sleep this soundly? Every single time you try it. And just for kicks, let’s say it doesn’t work. What’s the worst that’s happened? You’ve constructively used time that you would have otherwise spent in misery. Try a Rosary. Or a Divine Mercy Chaplet. Someone who is ill. Someone who has experienced a death in the family. A caregiver who doesn’t get relief. Someone enduring a trying time. What if I don’t know how to pray? What if I don’t know a structured prayer? Being Catholic certainly has its advantages. The Holy Rosary is a staple in our spiritual diet. 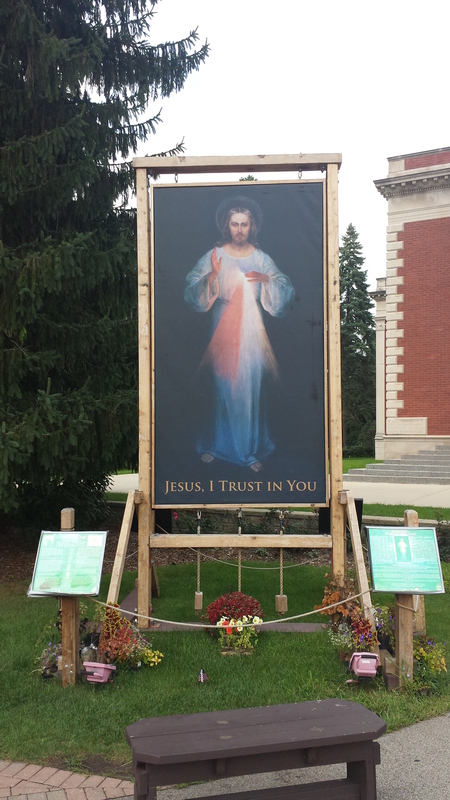 Besides the Divine Mercy Chaplet, there are various other chaplets. If you have a favorite, by all means, use it! It will work. But let’s say you are unfamiliar with prayer. The Rosary consists of five decades (ten prayers) of the Hail Mary, along with introductory and closing prayers and a meditation for each decade. 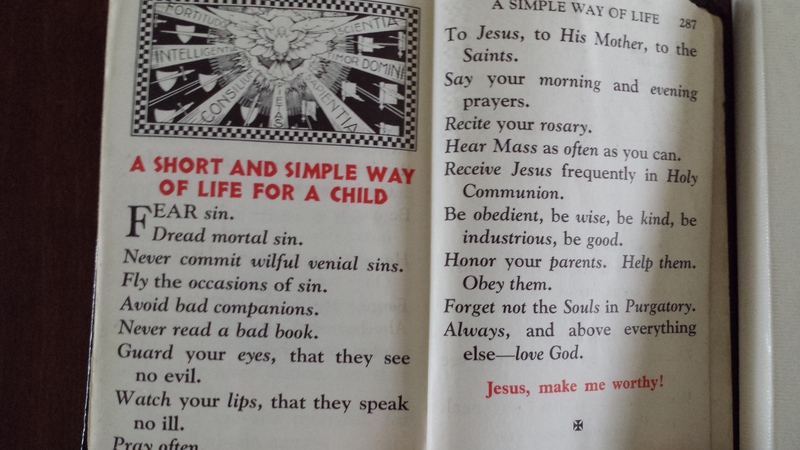 Don’t know how to pray the Rosary? Hail Mary, full of grace. The Lord is with you. Blessed are you among women and blessed is the fruit of your womb, Jesus. Think about the person or situation you are praying for as you pray. Say it ten times. Or don’t count. Just continue to pray it. Focus on the intention of your prayers. How much good have you done? And as you drift off to sleep, you are lifting up good intentions to God. Don’t doubt me until you’ve tried it. Mom’s birthday was Friday. I spent most of the afternoon with Mom and Dad, helping with a bunch of ‘odds and ends’ stuff. Putting away Christmas decorations. 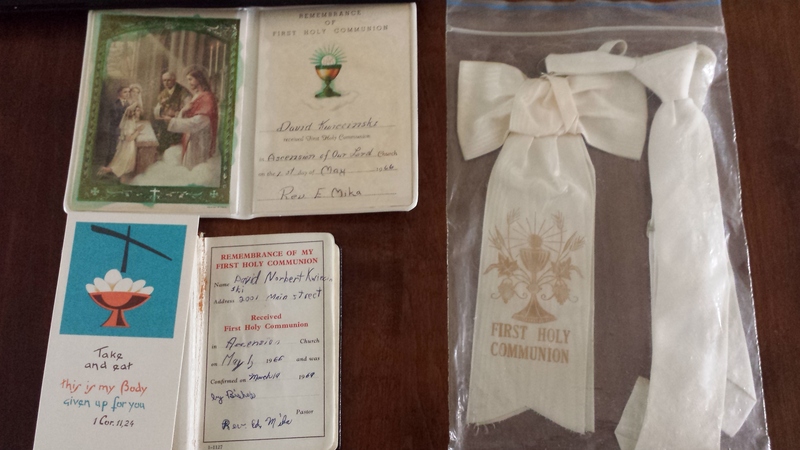 Going through a bunch of paperwork. Talking about stuff. About illness. About life. Things settled down a little later in the afternoon and I was able to get a little work done while Dad sorted through mail (he had only come home from the hospital about 24 hours earlier) and Mom kept boxing up Christmas decorations (it may take her another week to get it all done; no joke) and fielding phone calls from all the birthday well-wishers. She was one popular gal! Kathy’s work mate, Julie, lives near Mom and Dad. She drove Kathy to the house after work and we sent her home with a piece of Portillo’s chocolate cake. After singing to Mom, of course! After we sang and Mom blew out a candle, Julie surprised us by singing Sto Lat, the Polish version of Happy Birthday. Martha, our youngest, joined us for dinner. We left around 10. Saturday, we picked up the new car. I need a separate post about the car buying experience. We used TrueCar.com to get a buying certificate for the car, but that was only the starting point for assuring the lowest price. ‘Twas a very interesting experience. Suffice it to say, Momma’s happy with her nice new wheels. That means everybody’s happy! Stopped at the grocery store afterward, spent a ton of money and of course forgot a handful of items. Made a bunch of phone calls to notify all interested parties of the new vehicle, then Kathy and I did what we do best. Took off on one of our famous “just get in the car and drive” junkets. We had no idea where we were headed. Ended up along the Lake Michigan shoreline in southern Milwaukee, meandered into the downtown district, taking in the sights, finding some cool new neighborhoods, just enjoying each other’s company and discovering a bunch of cool things about the new car. Got home to an empty house. Thought the kids were going to be there, but they made last minute plans. We thought we were making dinner for a crowd. Not the case. Which was fine. And today… the joke’s on me. Kathy gets the new car. I get a new alternator. So I managed to limp back to the garage, but he’ll be picking it up to do the work when he can schedule it. In the meantime, my early appointment tomorrow morning gets cancelled. Kathy gets an unexpected ride to work. And I have to arrange for an alternate set of wheels until the job gets done. It will be a delicate operation. My 2003 Nissan Altima has 282,000 miles on it. But it still runs well, is still fun to drive, still looks like new (yeah; looks can be deceiving! ), and I really don’t want another car payment. Day began just fine. Martha and I were the Lectors for 7 AM Mass. Then out to Cracker Barrel for breakfast with Martha, Stephen, and Kathy. Had some laughs. Talked some business. Enjoyed being together. Then the inevitable bad news with my car. I knew it wasn’t going to be a pretty diagnosis. These are First World problems. Not life altering. Not life threatening. Just pains in the tail. We have more important issues confronting us. Like keeping Dad at home, getting him stronger, giving Mom a little breathing room. But it was fun to write about. Thanks for “listening” to my meandering thoughts. Car shopping could actually be the bane of my existence. Car shopping used to be the bane of my existence. As I was formulating the brilliant words for this post, I was all set to recount some of the horror stories of Car Shopping Through the Years. Like the time I went to the dealership when we desperately needed a van to fit us and the five kids. Our budget was tight and I needed to leave with a payment that was a certain amount and not a dollar more. I can’t remember what that number was. $150 a month maybe? $200? I don’t remember. I do remember the salesman coming back from his manager’s office with a number that was not my number. It was significantly more than what I wanted to pay. I matter of factly told him that was too much and was ready to leave. The guy went back to his manager and — lo and behold! — they met my price. Exactly. I was a terrible negotiator. I didn’t know how to do it. I just knew what I needed to happen. Or the time when we were at Arlington Nissan, ready to buy our first brand new van. As part of the process, I was also talking by phone with the owner of the old Nissan dealership in Gurnee. Simply trying to exact the best deal. The guys at Arlington sweetened their offer. So I called the guy in Gurnee back. What game was I playing? What was I doing? I stunk at negotiating. Or so I thought. All I thought I was doing was trying to get the best deal. The most vehicle for my money. Which was still a precious commodity. In retrospect, I guess the Gurnee guy had gone as far as he could. He couldn’t match the Arlington offer. Did that make me a good negotiator? Heck if I know. I was just trying to get the best deal. So, Arlington won. But then we had our encounter with the finance manager. And that took, well, forever. I remember stopping at the Burger King in Libertyville for dinner, with our three youngest kids. After 11 PM. Close to midnight. Yeah, that was a late night. Poor kids (he says, chuckling). Even the last vehicle we bought. An all day affair. This dealership. That dealership. Test drives. Listen to the bull$@!&. Play the stupid game. Make the deal. Get surprised by another hidden charge. Then dance with the finance manager. Did I ever mention I hate coffee? 55 years of my life, I had no need for a jolt at the beginning of the day. As a kid, I woke up when my dad woke up to get ready for work. He worked an early shift. So he was up early. So was I. Remember the test patterns on television? Before every channel was a 24-hour channel? When TV stations signed on and signed off the air? When WGN began and ended their day with The Star Spangled Banner and Five Minutes to Live By? Yeah, I remember those days well. When I woke up, my brain was already stimulated. No need for coffee. Then, last year happened. Dad went to the hospital. And it seemed like he was there for months. Oh yeah. That’s ’cause he was. My body still hasn’t recovered. My metabolism switch flipped (theme for another day). And averaging four to five hours of sleep every single night… day after day… week after week… finally caught up with me. The guy who never needed coffee to be fully awake suddenly needed a ton of coffee to get and stay awake and alert. I still don’t need coffee first thing in the morning (still a dangerous thing), but I’ve become addicted to the caffeine and its effect on my neurotransmitters. No caffeine: tremendous, debilitating headaches. Caffeine: no headache, but too much of it and I bounce off the walls. Today was one of those days. Way too much caffeine. Too early. Not enough food. And it was a car shopping day. Kathy’s car needs work. Nothing major. But expensive. Four new tires. A brake job. Probably needs new rotors all the way around the vehicle. Car just turned 69,000 miles. That got me to thinking. What would it take to get into a new vehicle? Same model. But new. Momma gets the new car. That’s the way it’s always worked. I get the reliable used car. Definitely more grunt work to find the right animal there. So I guess I’m complaining a whole lot about this process, but her purchases are simpler. But not easier. All I need do is recall with fondness all the anxiety attacks of dealing with car salesmen and finance guys. Kathy’s day off today. 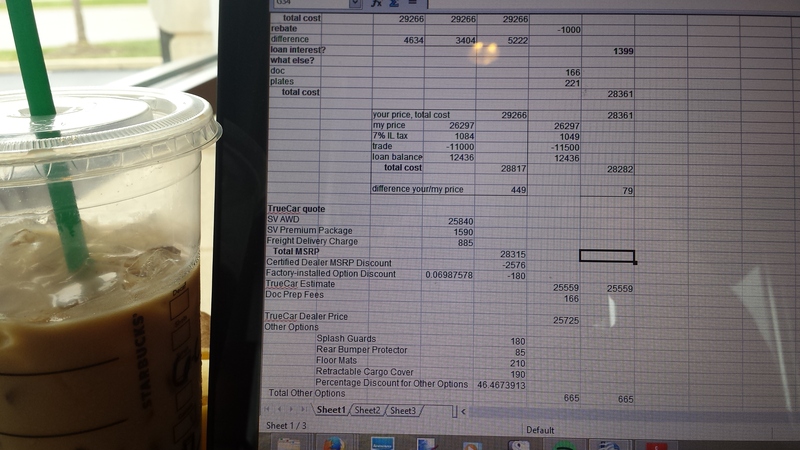 So here I was, all caffeined up, working the numbers, bouncing off the walls. Doing the nerdy thing recovering accountants/CPAs do. A spreadsheet, naturally. Car Shopping and Coffee. Lovely. What number makes sense? What can we afford to pay and how does that compare with what we have to do to her vehicle now? And can I sit still long enough to figure it all out? I had paid a visit to the dealership last Thursday. Joe, the internet sales manager, offered a test drive, a quick look at our trade, and a quick number crunch. He promised to have me out the door in half an hour. It took closer to an hour. The numbers didn’t look promising. We parted company amicably. He thanked me for stopping in. I did a little internet research Thursday and Friday to see what other dealers were offering for the same vehicle, similarly equipped. Was there enough wiggle room in the price to make it all work? Saturday, on our way to my niece’s Sweet 16th, I got an e-mail from Joe. The deal was suddenly much sweeter. Yesterday, I sneaked onto the lot of another dealership, undetected by any salesmen, to spy on their inventory. Just wanted to see what was out there, on the lot. In case Joe’s numbers were too good to be true. After phone calls to two other dealers, Kathy and I headed over to see Joe. It was 1:00. At 2:05, we were on our way home. Deal was done. New car, to be delivered from another dealership, on its way. 2015. Much nicer than our present model. Lots of high tech bells and whistles. And not much more per month than we’re paying now. And no out of pocket for the tires, the brakes, an oil change, this month’s payment. I hate negotiating. I hate car shopping. I hate coffee. But today, all three converged and created a surprisingly sweet experience. Am I a good negotiator? I know what works for us. I didn’t persuade anybody to do something that wasn’t comfortable for them. I don’t think I changed anybody’s mind. But I think we got a good deal. On the ride home, I suggested to Kathy that I should start a car buying concierge service. Okay, okay… I’ll temper my enthusiasm. I’ll stick with writing. I’d be remiss if I ended this without acknowledging Joe Matellanes at Ziegler Nissan in Lake Villa, Illinois. Joe, this was the most pleasant car buying experience I have ever had. I told Kathy on the way to the dealership that of all the folks I talked to, you were the guy I wanted to do business with. Thanks for making this painless. And now, if I get to sleep in 13 minutes, I get four hours of sleep. Tonia, Melinda… I still owe you blog posts. I haven’t forgotten. Morning From Hell? BAH! I Spit On Bad News! Car started. Fired right up. Despite the sub zero temps. Good thing. I had a 30-some mile trip this morning. Would have been a long walk. Only glitch in the preliminary portion of the day was leaving the house a few minutes late. And the car dying after turning the corner on the way to the credit union. But it fired right up as I rolled through a sharp curve on a lightly-traveled road. Good thing #2. Ten miles from home in the bone-numbing cold. Well, my right knee tightened up again on the ride to LA Fitness. That was unfortunate timing. But that’s the reality of two surgically repaired knees. They’re going to hurt… they’ve got a few miles on ’em. So I can use the knee as a lame excuse for my poor, pathetic, lazy play on the racquetball court. But it was really me. Unfocused. Poor fundamentals. The Starbucks was a mess this morning. Twice I had to ask the baristas to refill the half and half. The shaker of powdered chocolate was completely empty. The shaker of powdered vanilla was also empty. The tables were full of crumbs and sticky. Walgreen’s has eggs for $1.49 per dozen. No limit! Got ten cans of diced tomatoes for 29 cents a can. Got home ahead of the snow and blizzard-like winds. That was good, but I had to worry about Kathy’s drive home. And Martha’s drive home to Sarah’s. And Mom and Dad’s drive home from Dad’s LVAD check-up at Christ Medical Center in Oak Lawn’. Took them almost two hours to drive home. Normal drive time is less than an hour. Kathy’s drive was slow. So was Martha’s. But everybody got home safely. No morning hell. No afternoon hell. Just the frozen tundra of winter, rearing its frozen head. See how dull my normal life is? Do you ever wonder if it’s not meant to be your week? Of course you don’t. You don’t wonder. You can’t even think. You’re a diary. You’re inanimate. Not human, even. No matter! I’m going to talk to you anyway. It’s a clever writing technique. I didn’t finish yesterday’s post until after 11 last night. Spent an agonizing evening viewing the premier of the tragicomedy “Colorado Avalanche vs. Chicago Blackhawks.” It was billed as having all the elements of an action flick, but it was often as unexciting as watching paint dry. The Academy was so inspired by the Blackhawks’ performance, they created a new award immediately after the show: Most Shots On Goal With Zero Probability of Actually Scoring a Goal. The lack of sleep from the last two nights caught up with me. I nodded off before I finished writing, computer on my lap. As I scraped the contact lenses off my eyeballs, I was already dreading the 4 AM alarm. At least I slept past 3. Alarm sounded at 4. I didn’t roll out of bed until almost 4:30. Still groggy, but wary. It usually takes me an hour and a half to get out of the house. Today, I only left myself an hour. After the events of the last two mornings, I feared I didn’t leave enough time to get ready and out the door by 5:30. As usual, 5:30 arrived and I wasn’t ready to leave. Scramble mode again. Way too many things to carry to the car (will I ever learn? I think you know the answer), oatmeal firmly in hand until I had one foot out the door and reached back to close the door. Shades of Monday! Once again, I cradle the oatmeal bowl precariously as I reach for the door. This time, the oatmeal survives. Morning proceeds normally. Meaning: everything I think I have planned changes at the last minute. I survive the appointments and manage not to kill anybody. Always a plus, as doing so would be bad for business. Weather is frigid. Temperature hovering around zero. Unlike the last two days, there’s a little wind today. Happy that the car heater cooperates. It’s a 2003 Nissan Altima. Yesterday, the odometer rolled past 282,000 miles. I love this car, but it’s seen better days. In the last year, one minor issue after another has me hoping against hope that it will live another day. Being the model husband that I am, one of my stops on my way back north is at Starbucks for a cup of coffee. Then, off to my wife’s office to drop off said coffee. At 12:08, said Altima won’t start. At 12:10, I call Kathy, tell her what’s happening and that I’m taking her car to Panera to get some lunch and do some work. I also need to arrange for emergency road service. American Family now contracts with some service to handle their roadside claims. I was too distracted multitasking to catch the name of the company. The insurance company used to handle these calls. Must be cheaper this way. Cheaper or not, arranging for the jump and possible tow was anything but easy or simple. I spent 30 minutes on the phone with the representative. Glad I ate first. Allowed me the opportunity for heartburn as the call dragged on. Just kidding about the heartburn. But I am glad I ate. I was starving and needed the calories. Driver was supposed to arrive at 3 and confirm arrival by calling ten minutes before I was to meet him at my car. At 3:25, I get a call. I depart quickly, drive back to my car, exchange pleasantries with a couple ladies who are already done for the day and leaving. We chat about the winter fury that’s gripped us in the past handful of days and the prospects for a nasty blast of cold and snow tomorrow. Said 282,000-mile Altima starts immediately. Not a hint of a problem. By 3:39, I’m on the road. And heading to get my battery tested at Wal-Mart Automotive, where I bought the battery. I can’t remember when. I don’t have to wait at all. Pull the car right into an open garage bay. Battery tests out fine. It doesn’t need to be replaced. Great. Besides their speculation, there are no other symptoms. Well, car started just fine after the battery test. Then I had to stop for gas. Car started just fine then, too. 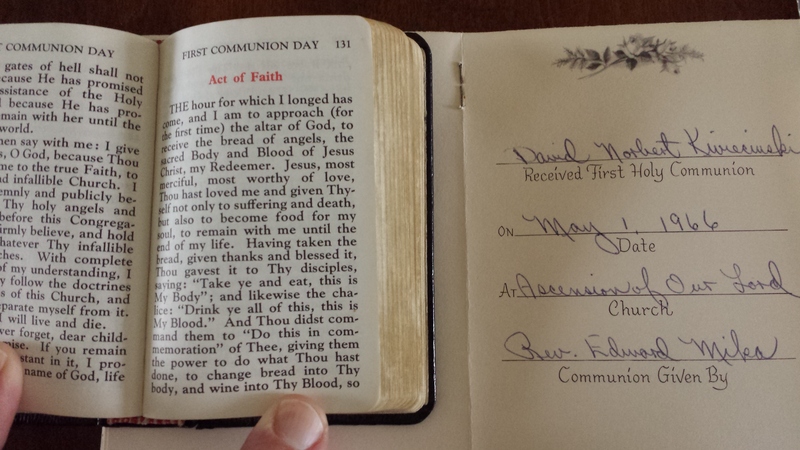 I should mention that today is Mom and Dad’s 59th wedding anniversary. How cool is that? A year ago, almost to the day, we as a family had sufficient reason to doubt that Dad would be alive to see another anniversary. In the grand scheme of things, my mornings — and now an afternoon — from hell are nothing more than benign amusement. Some laughs and lighthearted moments at my expense that elevate the blood pressure and stimulate the central nervous system, but are all a bunch of folly. Still, now living with the knowledge that my car didn’t start today, an incomplete diagnosis as to why it happened, and the coldest night of the year upon us, I’m in the Twilight Zone episode of “What Happens Next.” And folly or not, that kernel of doubt and uncertainty will be there every time I start the car. That’s not a real episode, by the way. Maybe I should write it. The Morning From Hell, Part 2. Is This A Pattern? Have you got it in for me? Are you jinxing me? Yesterday was bad enough. What are you trying to do to me? Up at three again this morning. But unlike yesterday, I was able to fall back asleep today. Today is January 6. Feast of The Epiphany on the traditional Catholic calendar. EWTN Radio was simulcasting the Mass from St. Peter’s Basilica in Rome, Pope Francis officiating. Mass was about half over by 4, maybe a little more than half. A pleasant way to start the day. Mass was in Latin, so I couldn’t understand everything, but that’s one of the cool things about being a Catholic. Any Mass, any language, any country and we still know what’s going on. Day here starts as most people’s day starts. Gotta “freshen up.” Didn’t have to shower this morning. Headed directly to LA Fitness for the first official racquetball match of the year. Quick shave, wash the face, move on. Well this morning’s “wait” moment was special. Pull handle to turn water on. Push handle to turn water off. Push handle to turn water off. … it is literally gushing out of the faucet in the off position. The faucet has been leaking for a while. An annoying trickle. Lately, it’s been a little more than a trickle and there have been a couple of occasions — of course late at night or early in the morning and almost always immediately before we’re about to race out the door — when the trickle has turned into a steady stream. And with the holidays, a repair job was the last thing I wanted to tackle. Diary, don’t tell let this secret slip. The conservationists will be all over me! Yeah, I know… I’m stealing water from the fish. Yeah, I know… we could use the same analogy my parents made about not wasting food. You know, all those starving children in China (how the heck were those kids going to get my leftovers anyway? ), all the people suffering from drought… blah blah blah blah blah. But it wasn’t that much water! The cost in time and effort (and money) did not justify taking immediate action. At least in my mind. … like yesterday’s “immediate action” required with the oatmeal crisis, this situation called for immediate action. This was real water loss. A real crisis. Cats will have to wait for breakfast. Brushing my teeth will have to wait, too. And my mood. Mmore than slightly surly. The halo I was wearing moments earlier? Washed down the drain with the water gushing from the “off” faucet. So today, shortly before 5 AM, I’ve got my plumber’s hat on. Mr. Fit It, as my family affectionately knighted me. And I leave the house with the bathroom faucet in pieces. The final half hour of my morning chores (yes, including brushing my teeth; I used the bathtub faucet) was another panicked rush. The poor cats got the short end of the stick. Oh, they got fed, but Daddy wasn’t his usual jovial self. The faucet’s repaired now. Life has returned to normal. The fix was about a six minute job, max. Ace Hardware even replaced the faucet cartridge for free. Lifetime warranty. So that was a bonus. But gee whiz, can we lose the morning drama? My hair is gray enough. And thin enough. You are currently browsing the archives for the General interest category.